Legend says that if you throw a coin into the Trevi Fountain, you will return to Rome. It is around this premises the film Three Coins in the Fountain (See full review here), revolves. But really, that's just an excuse for seeing the sites of the Eternal City in enduring style with clothes like these. Anita attends a family party, taking part in a forbidden office romance. Her outfit is beautiful yet casual enough for her outdoor surroundings. Yellow and polka dots add a sense of fun, and work surprisingly well with an orange bolero and gold accessories. Keeping a sun hat and thick heels also help her handle herself in the seep hills of the Italian countryside. 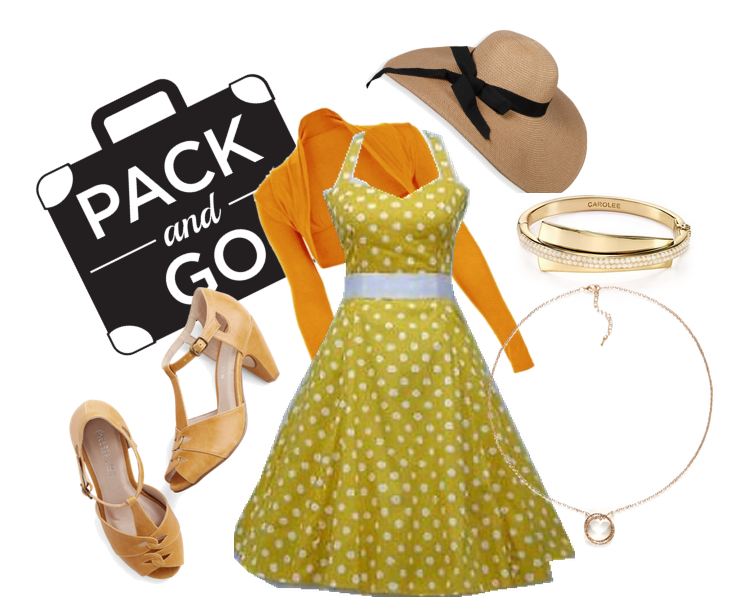 When Anita later meets up with her new love interest, she's still well dressed in a green wiggle dress, but keeps things casual with the accesories. A trench coat and flats are not only simple and chic, they are practical for traversing across the cobblestones of Roma. Add just a touch of 50s glamor with retro sunglasses and earring for a final touch. LOVE that green dress and I need to watch this. I'm pretty sure I tried to watch this movie before but didn't make it all the way through.... I do however love these outfits!!! Gotta love wiggle dresses!! I'm always so amazed at how closely you can match these outfits from the movie! That looks just like her polka dot dress.